James Milner admits Ragnar Klavan’s departure has left him to bear the brunt of the ‘old’ jokes from his Liverpool teammates. The Estonian, who turns 33 in October, recently sealed a £2million move to Serie A side Cagliari, leaving Milner as the oldest player at the club at 32-years-old. Though Milner’s age is evidently having no negative impact to his influence on the pitch, it is something that has evidently made him the easy target for Liverpool’s jesters. Despite his veteran status, the Englishman remains in impeccable condition and boasts a reputation as the club’s fittest player according to pre-season tests. 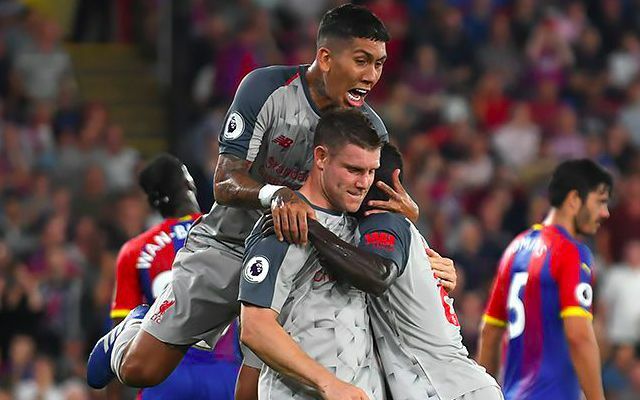 Milner has been one of the standout performers for Jurgen Klopp’s side over the opening two games of the Premier League season, reminding the club’s new signings of the fierce competition for places. The midfielder has picked off where he left in the previous campaign as an unrelenting implementor of Liverpool’s high intensity pressing and ball retrieval. His fine form is already proving useful in granting new arrival Fabinho the extended time he appears to need to settle into life on Merseyside and reach full fitness again. Liverpool’s vice captain was on the scoresheet in Monday night’s win over Crystal Palace, converting a penalty on the stroke of half time to make it eight consecutive goals from the spot. The victory also means Milner is now unbeaten in the 48 Premier League games in which he has scored.